YOUR SANTORINI PORT TRANSFER & SHUTTLE. THE BEST IT CAN BE. 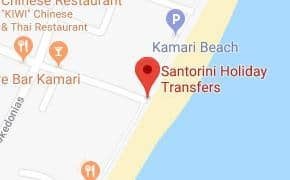 Santorini Holiday Transfers is a Santorini shuttle service that provides transports from and also transportation services to Fira, Oia, Kamari, Perissa, Airport (JTR) and other destinations in Santorini. Whatever your destination in Santorini, our experienced drivers will be able to help you and make your transfer comfortable, reliable and safe. We are proud to offer you safe, efficient and reliable transportation services. The ships to Santorini arrive at Athinios port, while only cruise ships dock at the old port of Fira. Ferries from Piraeus to Santorini operate daily. Depending on the ship you choose and the route, the duration of the trip varies from 5 to 9 hours. If you travel by high-speed boat from Piraeus to Santorini, the duration of the trip is the fastest but also the most expensive. Whichever ship you choose, enjoy stunning views as the ship arrives on the island. Once the ship enters the port and the visitor is between Santorini and Thirasia, it is overwhelmed by the incredible beauty of the cliffs and the bright sky, unlike the deep blue of the sea and the brown of the volcanic rocks that create a scenery unique in the whole world. The more the ship approaches Santorini, elements of human presence – small white houses and blue domed walls – appear to be high up on the edge of the cliff – which are another impressive picture that will remain unforgettable! Santorini is one of the most popular summer destinations in the world. There are 2 ports in Santorini. The first port is in Fira (the capital of the island) and the other port is called Athinios and is the main port of the island. Athinios is 12 km away from Fira and serves all the major shipping companies that come from Athens (Piraeus port) or Crete. The new port of Santorini (Athinios) is located southwest of Fira and there you will find cafes to enjoy your coffee in case of waiting for the ship as well as travel agencies to serve you. Because of the morphology of the soil and the rocks, the road leading to Athinios is narrow and convex. Santorini Holiday Transfers provides fully inclusive pricing, no hidden extras Santorini port super shuttle service.